As the push for more STEM (science, technology, engineering and math) education continues, many educators are turning to maker education to engage students through hands-on projects. 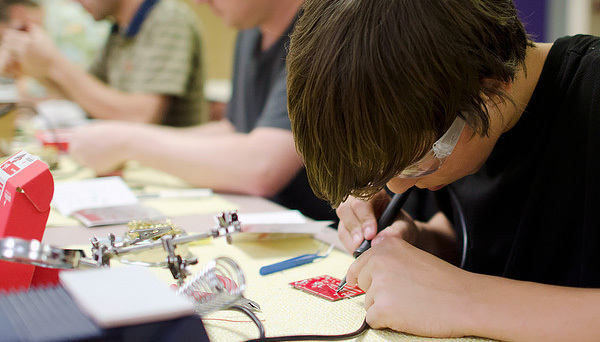 Below are our top five reasons to add maker education to instruction. Students learn more deeply when they are having fun. Maker education encourages students to create projects that they conceptualize and design themselves, leading to authentic learning experiences that students are invested in and excited about. This focus on creating a project leads to higher levels of motivation, fueling deeper learning and encouraging students to continue exploring beyond what is required. "I see students doing more work outside of class because they are truly excited and interested in what they are learning; it’s not just busy work or homework." Learn more about how student motivation boosts learning. 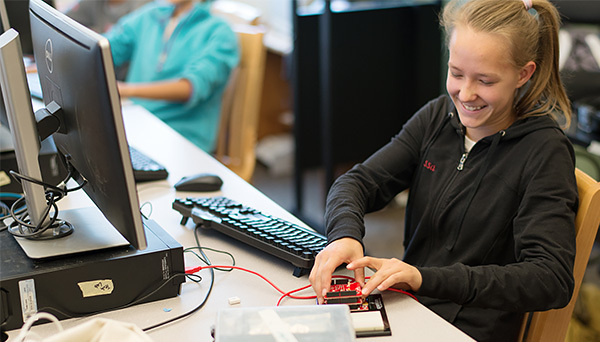 Maker education not only allows students to see concepts in action; it also enables them to see how what they are learning in one class applies to another. When maker experiences are incorporated into every class, students are able to see how each subject builds off knowledge and skills from the others to create a “big picture” that mirrors the real world and demonstrates knowledge of multiple academic standards. "The fact that these kids are learning that one simple little mistake like an ledPin vs. ledpin will mess up their whole code is massive. It is translating over to their core classes and how they need to pay attention to their work at all times. Some teachers have mentioned tougher kids and kids who have struggled with grades are starting to perform better as they are being more careful with their work." Projects can be designed to focus on concepts from multiple subject areas. Imagine an art project where students create an electronic light sculpture and then program designs to appear using a state standard for decimals, or a physics project where students build marble runs to explore light, or a history project where students create a map that lights up key locations and plays a recorded sound file to explain the events that took place there. In each of these activities, students are able to display understanding in more than one way, with organic, cross-curricular connections that may not happen in a more traditional setting. Even when projects are not specifically designed to incorporate multiple subjects, maker education impacts the way students approach their learning across all of their classes. STEM/STEAM education is essential for the future economy as well as students’ future success. STEM skills are critical for the workforce today’s students will be entering. It is estimated that STEM careers will grow at 17 percent, while other career fields will only grow at 9.8 percent, making it important for all students to be exposed to STEM education. Maker education has the ability to attract students to careers in STEM simply by exposing them to what is possible and letting them try it for themselves. 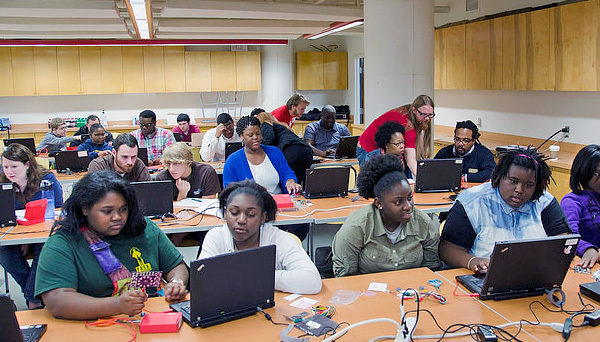 Additionally, the wide range of tools available for maker education makes it possible to engage a diverse set of students who may otherwise not feel that STEM is for them. "In my engineering lab class, I had one girl who started out not interested in engineering at all. By the time we were done with the balloon launch project, she was hooked on engineering!" Students experience deeper connections when they can learn by doing. Hands-on lab work in science has long been used to reinforce concepts for students and increase their level of understanding. Maker education brings the concept of learning by doing to other subjects as well and shows students that mastery can be demonstrated in multiple ways, both inside and outside the classroom. Many studies have found a connection between hands-on learning and increased test scores, which occur as a result of increased knowledge retention. This one found that when hands-on learning is incorporated into traditional lecture-format STEM subjects, average exam scores increase among minority students. While this one found that "students who engaged in hands-on activities every day or once a week scored significantly higher on a standardized test of science achievement than students who engaged in hands-on activities once a month, less than once a month, or never." Similar studies have also found a direct connection between project-based learning and an increase in long-term retention and attitudes toward learning. Taken together, these studies present a compelling image of increased student retention of knowledge that translates to increased test scores. The project-based nature of maker education forces students to choose how to approach their learning in order to complete a project. Typically, a project prompt lends itself to multiple ways of solving the problem, requiring students to analyze the situation using critical-thinking and problem-solving skills to determine the best approach. The more often students do so, the more these skills will develop — and they will start to see connections they may not have noticed before. 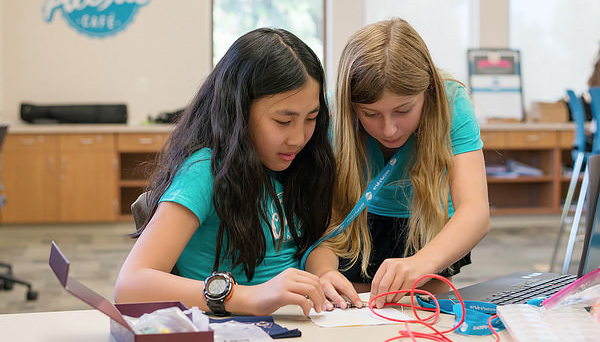 As they work their way through a project, students will come up with new ideas and try various approaches — discovering that the first one rarely works. This encourages curiosity and tinkering, which lead to questioning and deeper learning. 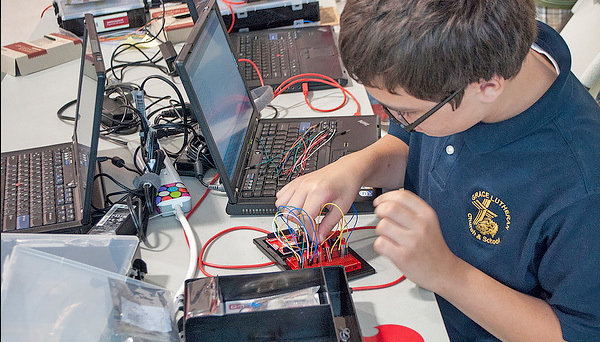 Find ideas and get advice with our 6-part series on tech trends in maker education.